A fun race. A cold race. Actually the coldest race I've ever run before. It seemed fitting give this was the coldest week I've ever run in as well. The race was well organized, friendly volunteers, lots of people, and great finish line food. A great race to start off the year. 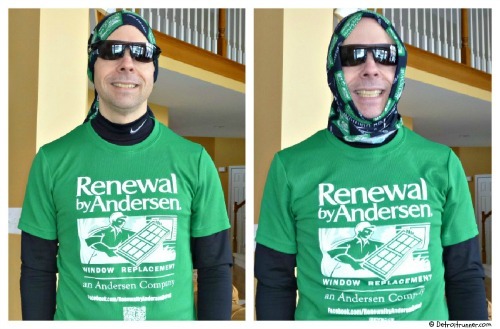 Thanks to Renewal by Andersen of Detroit who sponsored me for this race! Check them out on Facebook(here) for your chance to win a race entry. Since I was sponsored by Renewal by Andersen of Detroit, I did not have to register but you had two choices. You could register by printing out a form and mailing it in or you could register online. I noticed that the website and the registration was done by Hughesware Computer Services, a local company that seems to be doing more and more for local races in the area. They did an excellent job on the website and online registration. It looks similar to some other race sites they have done and they are very user friendly. I happen to know one of the owners of Hughesware and they have done a great job supporting the running community. The race started at 11am. It's a first for me to start a race this late in the morning. It was really strange to be able to sleep in and then go to the race. In addition, the race was nice and close so I didn't leave my home until 9:45am. I will say it was nice not to have to get up at 4:30 or 5am to get across town but I probably would have liked to see a 9am start time. As soon as you got to the race, which was located in Stony Creek Metropark at Eastwood beach, there was an information booth. A great idea! Not that it was hard to find anything but if you had questions, they were right there for you. This is also where you could find your race results after the race as well as where race volunteers checked in. They also had warming tents. I had not run this race before so I was really concerned how people would stay warm before the race. Fortunately they had two very large tents that people could come into to stay relatively warm before the race. This worked out great. Warming tents - a savior! The race also provided port-o-potties in the start area. There was a pretty large line before the race but I believe there were enough there to get everyone to the start on time. Right in the start area was also Renewal by Andersen of Detroit's tent and poor Brandon had to sit there freezing for several hours. It was windy off the lake too. We were able to get a great picture before the race of the team except for Dawn. After our team picture, I was able to meet several local runners. Some who actually follow my blog - I'm flattered and was very happy to meet them. Sherri and Alexis are going to be training for Bayshore Marathon this year for their first marathon. Awesome ladies!!! It's a great marathon! The ladies of Detroit Runner.....I kid! Sherri, Alexis, ?, Dawn, ? 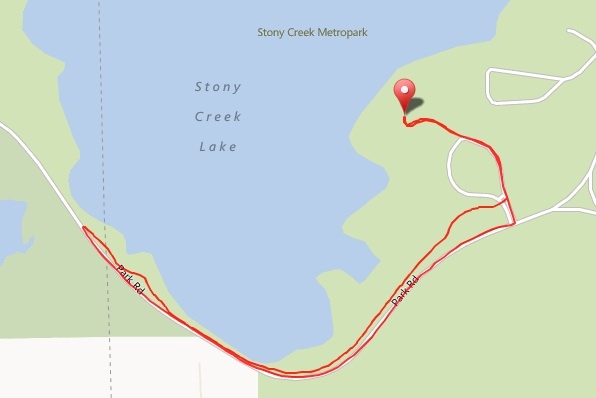 The course was located in Stony Creek Metropark in Eastwood beach. This is the park where I do all my long runs in the winter and also run many times throughout the year. It's my stomping grounds and I'm very familiar with the park and the course we raced today. The course is a simple out and back course that goes out on the road and comes back on the trail. For those of you concerned with snow, you don't need to worry about it since the park does a great job clearing the roads and running path. The elevation is flat as you can see from the elevation map per my garmin. There are some slight hills but really nothing to worry about. Stony is a rolling hills area but most of this race is flat here and a great 5k for any skill level. It really is a great area to run. Of course, I'm biased given it's my training grounds on an annual basis. A couple minutes before the start time and we headed to get in line. They did the National Anthum and we were off. The start was extremely slow. As you can see, it does not look like like I'm that far back from the start. I probably should have moved much closer, though, since I had to do lots of running around people for the first quarter mile. I probably would have saved myself 30 seconds. I had anticipated there being many more faster runners(at least faster than me) so I moved back from the start a bit. The race was not something I planned on racing since its so early in the season so it did not bother me but I suggest moving very close to the front if you are racing and are fast. The crowd started to thin out a bit here once we got onto the parks main road. I love the shirt on the runner on the left. It says "I don't do winter." Ha! Below was THE coldest part of the race. It was incredibly windy out there today. I thought my face was going to freeze off. I was Freezing my Franny!!!! Seriously, though, it was crazy cold and I should have known since I'm out here on a weekly basis. The temperature was in the low 20's for the race. The coldest section of the race - windy!!! The wind around this bridge can get pretty brutal and this day did not disappoint. As I passed runners, I could hear all the heavy breathing everyone was doing from the cold. Regardless, I really enjoyed the familiarity of the course. By the time we hit this part of the course, the wind was blowing like crazy and I was happy to be dressed warm for it. To the far right is the lake but the winds were coming from the left which is unusual for here. You can see the faster runners are already on the running path on their way back. Once you got back onto the trail after the turn around, the winds died back down and it was not so extreme. Did I mention it was still cold out? Haha! The bridge seemed to help keep the winds in check because I didn't really feel them any further. Also, I was starting to warm up too. It's difficult to tell but there are ice fisherman on the lake way out there. Also notice that the path is fairly clear with some puddles and slushy parts as well but overall cleaned off good enough to race if you wanted to. This is the last stretch of the path near the boat launch and really where the first hill is. Nothing big at all but it slowed me down just a bit. We finally rounded a corner and headed back into the parking lot where the finish was right where the start area was located in Eastwood beach. I would also like to note that all pictures taken on the course were taken by me and that I don't stop or slow down on the course. I run my regular stride so I don't interfere with other runners. Some pictures come out and some don't. There was one aid station at just over mile two. A couple really brave volunteers sticking it out for us runners. Wow - now that is a committed volunteer for sure! Hats off to them. They only had the one station since it was just a 5k race. I realize that most 5k's probably have two stations but can certainly understand things are a little different when you are talking these extreme temperatures. The aid station - sorry for the blurriness - I was racing after all. The finish area was also well organized. The first stop for me was the soup station. The race had two different kinds of soup available to try and they were delicious! It's a great idea to have hot soup at the finish with these temperatures. Next I went through the beverage and food line that was also heated with these propane heaters. The race also offered hot chocolate, hot Starbucks coffee and water. In addition, they had all kinds of goodies including bananas, chips, granola bars, Rice Krispy treats, pretzels and candy. A great food spread for a 5k race and once again the volunteers were awesome. 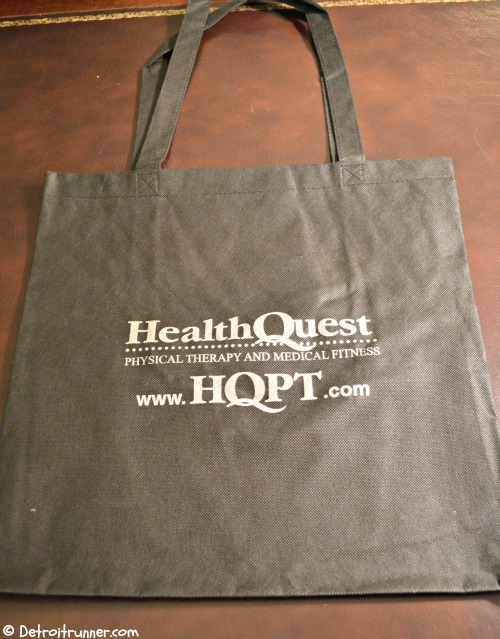 Included with your race packet, you got a bag for your shirt to go in that was given by a sponsor. You also received a long sleeve tech shirt. I like the design and its grey which is a color I don't have so it will be a nice addition to my collection. In addition, the park police closed part of the streets and the race was timed with a B-Tag style bib. This along with the great finish food. If you were lucky enough to place first or second in your age group, you could have received a medal too. One minor thing that I thought was odd was that they did not have a medal for the top three in the age group like most other races. 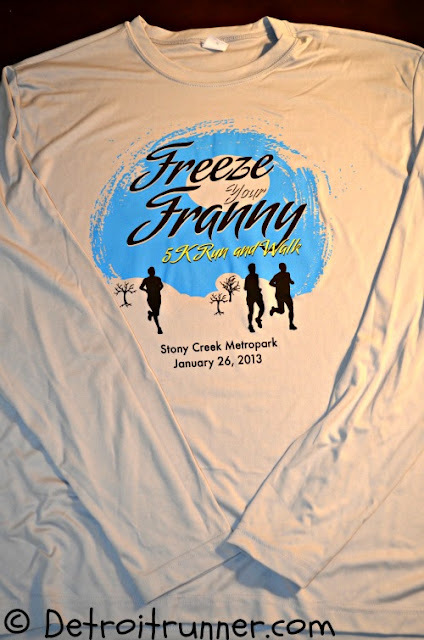 The race shirt is a unique design. While I like the design, I'd prefer not to have as much design on the shirt. What I mean is, if you look at the shirt, the blue part is quite large so you can feel that through the shirt. I like when the design of the shirt is minimal. 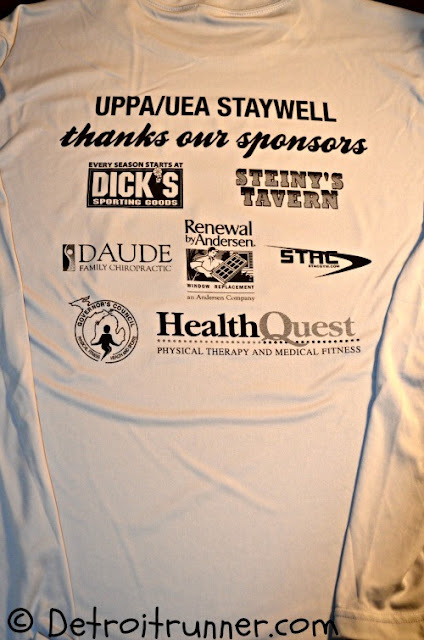 The shirt is also a tech shirt which is great considering the cost of the race was only $20 if you registered early so a really great value for this race. One of the best values I've seen for local races. Another thing I received but was not from the race but from Renewal by Anderson of Detroit, was their company Buff. See below. The Buff is a cool thing that is great for runners. You can use it as a beanie, a Balaclava, a neck warmer or even to look like a old lady running as I look below. Haha! It was one of the best freebies I've received at a race and I know I'll put it to good use this winter. or act like you're an old lady - haha! The race was well organized. The layout of the start/finish area was great and well thought out for a winter race. The volunteers were helpful. The course was well marked with volunteers to help. There were plenty of signs to get you there if you had not been in the park before. Overall this is a race that I would certainly do again. You could tell the race organization has put this together before and their experience shined throughout the entire race process. It's also a great price. It's a bonus that the race is close to home(for me) as well as an opportunity to start your year off with a race in January. This is the first race I've ever run in January. Thanks again to Brandon and Renewal by Andersen of Detroit for allowing me to race with your team again and so I could Freeze my Franny! Great race in the Cold! Way to go. I barely even attempt to take pictures while running/racing because I refuse to stop or slow down and they never turn out. Kudos for you for trying! wow! Isn't it great when races are put together well? Great race recap and yea, that was one of the coldest runs ever and for sure the coldest race! Great Pictures too! I wasn't about to take my gloves off! Can't beat a buff, best race gift around. Hope you have tried it out in all it's forms; headband, beanie, bracelet/nose-wiper, pony-tail-holder (ok I can't do that one either), balaclava, scarf, facemask, ... and of course everyone's favourite the pirate bandana! Hey, no stealing my speedy runner ladies! :) The other two are Dee and Katie - they are my Brooksie Way Team. I hope will have another run at it this year. Glad you had a good race! Thought about going but didn't enter the contest in time and am trying to not pay for races I'm not prepared for. Nice pictures - don't know how you get em on the move, but good job! Thanks Josh. By the way, I take lots of pictures and hope I get a few steady ones along the way. It takes a little practice especially with mittens. Love your recaps. Good job on the race Jeff! Nice recap. I'm bummed that I lost my Renewal buff before the start of Freep. I really should replace it before Sunday's race.